How about we make a deal? And no I don’t mean a Theresa May – Europe kind of deal. A real deal. A Lentil Tacos Deal, to be precise. 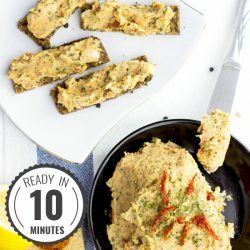 How about we promise to supply you with a recipe so awesome, so tasty, and so easy that you’ll want to make it all the time? Deal? You’re on. 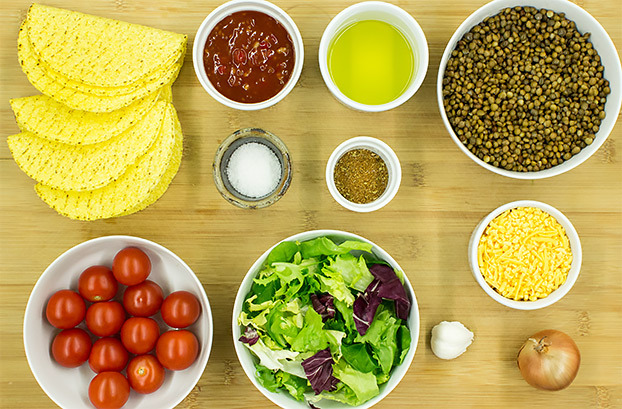 And this lentil tacos recipe is the real deal. It’s a new favourite here and whenever we have spare tacos or lentils it gets made, instantly. Without discussion. We take our food seriously, and we know that food means different things to different people. Take healthy food, for example. What exactly is that? Something with no sugar? Something with no trans fats? 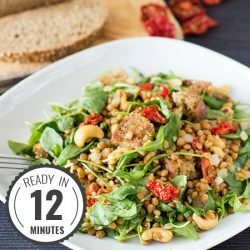 Something that’s rich in protein and fiber? All three? 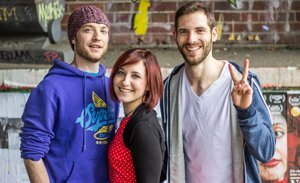 It’s hard to say, and it depends on the individual situation – and moderation, of course. Similarly, what is easy food? Or quick food? Something that takes thirty minutes? Twenty minutes? Five? It all depends on what you put in, and what you expect. Back to the lentil tacos. These are the ultimate foods in terms of levelling up. You can follow this recipe to the letter and you’ll have one awesome meal waiting for you. And if you want a health boost? A speed boost? We’ve got that covered, too. 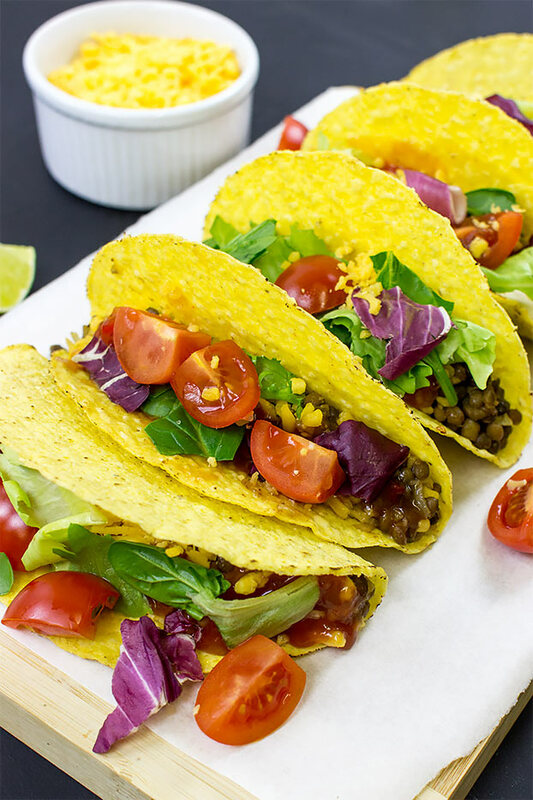 LENTIL TACOS – your food, your choice! 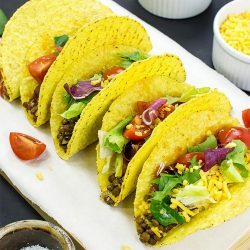 This recipe uses lentils (not surprising), tacos, (again, not surprising), salsa and seasoning as four of the key ingredients. These can all be bought in a store, and used ‘as is’. They’re quick, easy, and often taste great. 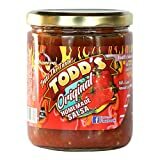 Make your own salsa? Cut down on sugar and salt. Takes five minutes – max. Create your own seasoning that lasts for weeks and weeks – nail your favourite flavour, easily. 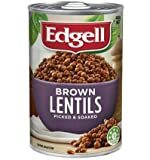 Cook up your own lentils instead of using store-bought tins. No preservatives, and you can even make in bulk using something like an instapot. 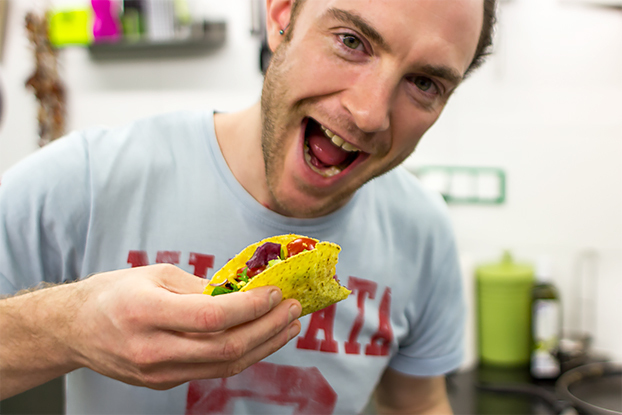 And finally – make your own tacos! It’s easy, fun and you know exactly what’s in them. 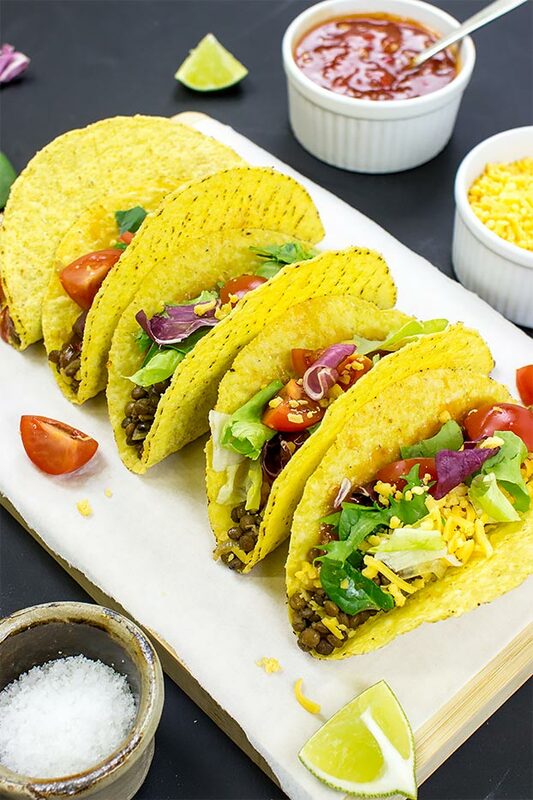 Just hang them over a wire rack in the oven and you’ll have a perfect homemade taco. These are all just options. Don’t want to do any more than the bare minimum? That’s totally fine. 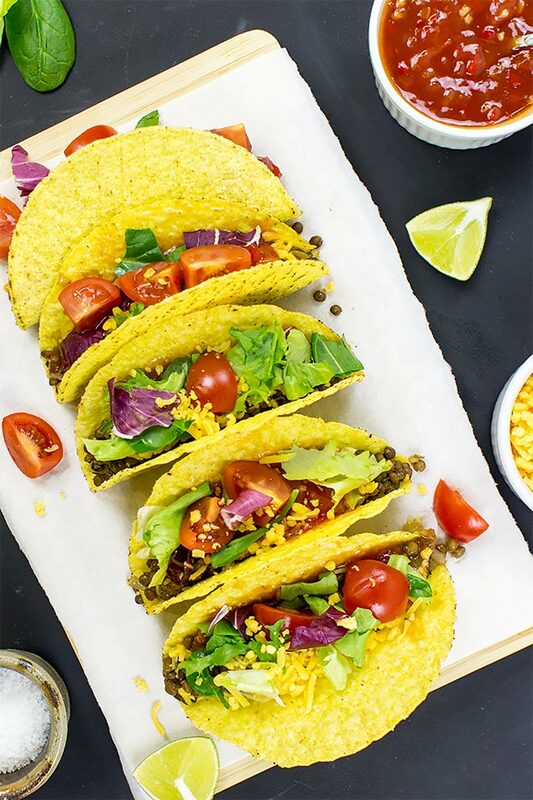 Just follow the base recipe and you’ll still have AMAZING lentil tacos. Got someone to impress? Want to take it a step further? Choose one or all from the list above. It’s your food – enjoy it! These veggie lentil tacos are our new go-to meal. 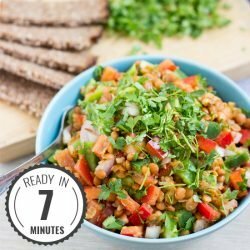 SO TASTY and stacked with lentil protein and fiber, it’s time to take dinner up to the next level. Dice the onions and garlic. Heat the oil in a frying pan and add the onion. Cook on medium heat until soft. Add the garlic and drained lentils and stir well. Next, add the fajita seasoning and the water. Keep stirring it well. In the meantime, put the taco shells or wraps in the oven. They’ll just need 2-3 minutes to cook, but check packet instructions. Wash the salad and tomatoes, then slice the tomatoes. 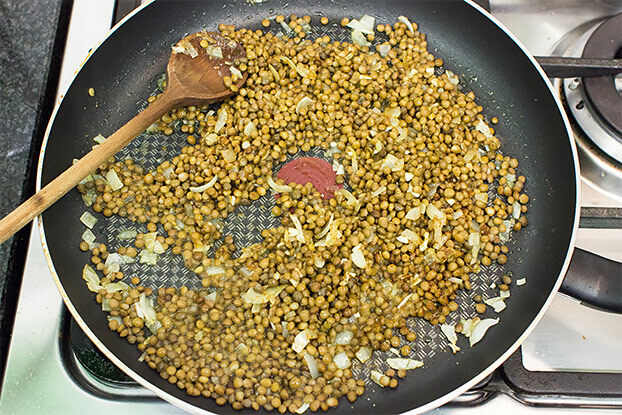 Cook the lentils until the water has evaporated – this won’t take long. Layer lentils along the bottom. Next is the optional cheese. Then comes the salsa followed by the salad and tomatoes. Enjoy! Want more of the same? Sweet potato burritos are right this way. And they rock. 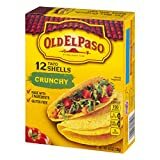 As do these authentic tacos with a sweet mango sauce. Yum. Please note that the nutritional is per filled taco, including cheese.